Good News… We now have 44,000 more public sector union members! The Airport screeners union just ratified their first contract with the government. The nation’s 44,000 newly unionized airport screeners have ratified their first-ever collective bargaining agreement, giving them more say in what they wear on the job, the shifts they work and the time off they take, whether they can change from part-time to full-time work or back, their union announced today. 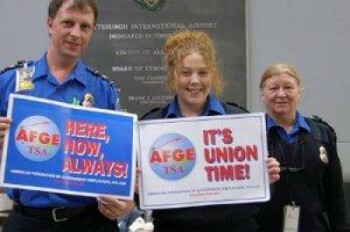 The American Federation of Government Employees union, which won the right to represent the screeners in an election last year, said its members voted 17,326 to 1,774 in favor of ratifying the first labor deal struck with the Transportation Security Administration since the agency was founded 10 years ago in the wake of 9/11.